Children's activities are a great way to explain the concept of divorce. Divorce is especially difficult for children to understand. In fact, parents are often unable to articulate the exact factors that led to the decision to separate. Often, activities that permit parents and their children to discuss divorce in a nonthreatening environment are the best approach. Many of these activities indirectly address the concept of divorce, and such communication activities are sorely needed. In fact, one survey examining children’s experience of parental separation revealed that only 5 percent of children felt completely informed. Children love to be creative, and parents can use such relaxing activities to explain some of the more complicated aspects of divorce to their children. For example, children can create a drawing about divorce. The University of Missouri Extension office offers several specific activities: “What does divorce look like?” and “How does divorce make you feel?” Parents should play along and ask questions about specific aspects of the creative work and use the opportunity explain how the divorce will affect the child. Navigating life post-divorce is uncharted territory for children and parents alike. Quality time spent reading and learning about how fictional characters cope with divorce is an excellent way to relay some of the changes your child will experience. In one such book entitled “Two-hug Day,” Niko is a young child navigating life between his parents' separate homes. Subtly point out the similarities between your child and the child in the book; this can include mentioning the two-home living arrangements, the packing and unpacking of bags and the inevitable mixed emotions accompanying such upheaval. Children love to put on plays, so use the opportunity to answer questions and provide age-appropriate information about divorce. Create a stage with lights and use stuffed animals as stage actors for the family members. 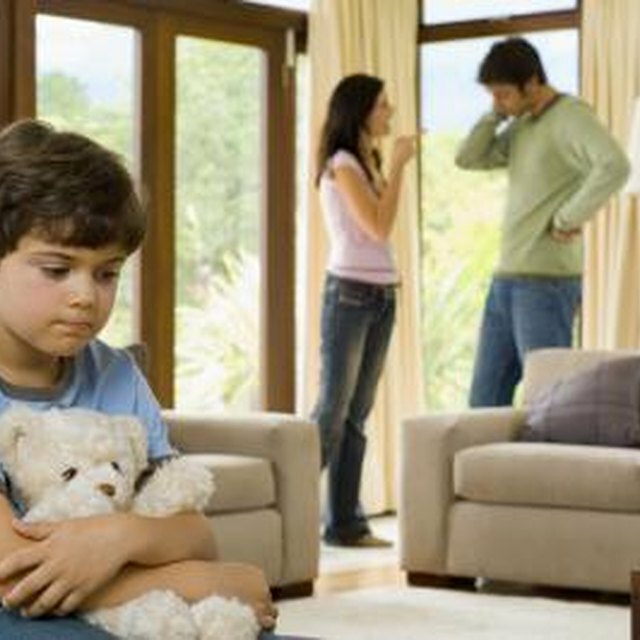 Children can act out scenes from their life by having one stuffed animal ask another questions about divorce. A parent can use another stuffed animal to answer the questions, provide reassurance and address any incorrect beliefs held by the children. Act II could portray a day when the child travels between homes. Puppets are a great alternative for younger children and those children unwilling to participate. Playing theater permits children to ask questions and receive thoughtful answers through the safety of stuffed animals and acting in character. One of the most important activities is simply scheduling regular question and answer time with children. The routine provides security and encourages children to ask questions. When parents regularly schedule a designated time to discuss divorce, children become more confident to ask difficult questions especially as they learn their questions will be taken seriously. Dana Bagwell has worked in the research-and-development field for more than a decade. His work has covered gerontology, cognitive assessments, health education interventions, social science theory and research methods. Bagwell has also contributed to several scholarly publications, including "Experimental Aging Research" and "Clinical Interventions in Aging." He has a bachelor's degree in psychology and is completing his doctorate in health policy.